What could be better than a visual history of hip hop, told not only through the lenses of the photographers who shot these images, but through their personal accounts as well. What’s most unusual is the presentation of these images in the form of contact sheets, rather than prints. According to author Vikki Tobak, her goal was to reveal the photographer’s creative process and techniques, rather than assemble the curated “money shots” we typically see in print. Organized chronologically, Contact High captures many of the genre’s transformative moments. As Tobak states, “both artists and photographers understood the power of words and the power of imagery,” and their collaboration is certainly apparent. Beginning at ground zero—the Bronz, 1979—we meet Joe Conzo, who started photographing hip hop events while he was a high school kid. Included among the pages are his images of Kool Herc, Tony Tone, The Popper, as well as several key events. There were also many woman photographers on the scene in the early years, including Martha Cooper (Rock Steady Crew) and Sophie Bramley (Fab 5 Freddy, Futura, Keith Haring), and in later years Janette Beckman (Run-DMC, Salt-N-Pepa, EMPD, Slick Rick), and Lisa Leone (Snoop Dogg, Nas). The timeline comes to a close in 2012 with the documentation of contemporary rappers such as Nicki Minaj, Tyler, the Creator, Kid Cudi, Gucci Mane, and A$AP Rocky. As Tobak concludes, “[The photographers] careful eye and love for the sound built the archives of hip-hop imagery that exist today, crafting a collective cultural document that has gone on to inspire conversations about art, identity, race, and popular culture.” We’re lucky to be able to experience at least a small slice of this archive in Contact High. 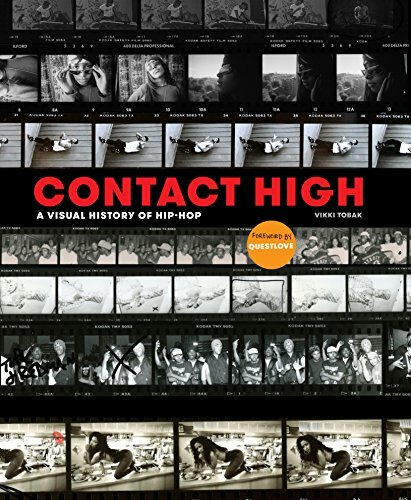 This book would make a fine gift for any hip hop fan or photographer, and is also highly recommended for libraries. 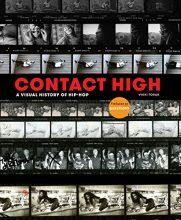 This entry was posted in Rap and Hip-Hop and tagged Book Review, Brenda Nelson-Strauss, Clarkson Potter, Contact High: A Visual History of Hip-Hop, Random House, Rap and Hip-Hop, Vikki Tobak by aaamc. Bookmark the permalink.